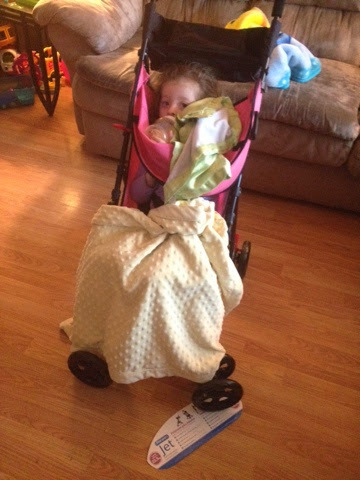 I ordered a umbrella stroller two days ago online from walmart.com for Aubriella. It arrived today. I didn't expect it until the end of next week. When we came home from the doctors I was surprised to see it sitting on the front porch. I had done research about a month ago to see exactly what I wanted. First off and most importantly, I wanted something that would hold over 40 pounds. 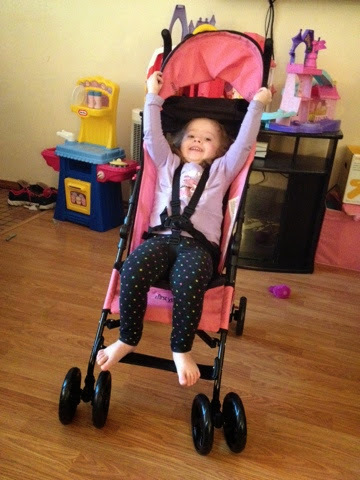 I was afraid she would grow to fast this summer and not be able to use the cheap ones. I also wanted something that had good reviews and was going to last. Price was also a factor. I didn't want to spend an arm and a leg not knowing how long she is actually going to realistically use it. 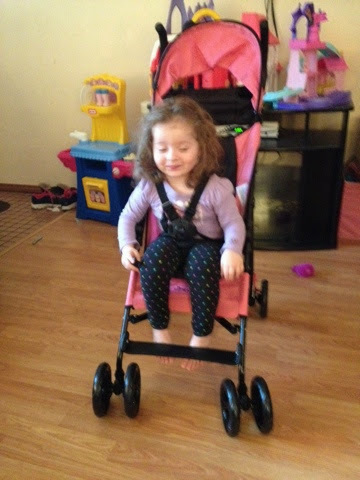 The jogging stroller I've had since Ella was born is a pain. I didn't do research before we bought it. It was a splurge on a whim for a good price. You can't run with it, it shakes to much. The straps were starting to get fight and just didn't fit right. And Ella could escape out of it. As soon as I put it together she got in it and loved it. She wanted to go for a walk but it was raining outside so we just ended up walking around the house. Ella ended up spending most of the day playing in the stroller. She sat in it to watch tv, drank her bottle and relaxed, played with her Minnie Mouse toys.... When she finally fell asleep we put it away.